Second reading of voter ID bill passed 32-11; Sen. Ben Clark voted in favor of the measure. The voter ID bill moving through the legislature is not as “restrictive or burdensome” as some Democrats feared but it is still flawed and rushed, according to criticisms voiced in the most recent Senate debate. Republican senators and three Democrats voted to advance Senate Bill 824 on its second reading Wednesday night — a measure that will implement a constitutional amendment enshrining a photo identification voting requirement in the constitution. He added that lawmakers hadn’t the “furthest idea” of what the unfunded mandate would cost the state or the county boards of elections, which are locally funded. The only fiscal note attached to the bill does not provide an estimate of what implementing voter ID will cost the state; it only lists costs associated with prosecuting people with a Class I felony, which is newly created in the bill for people who make fake IDs for voter fraud purposes. Still, the Senate is expected to take its final vote today at 9:30 a.m. Sen. Joyce Krawiec (R-Forsyth, Yadkin) said lawmakers have an obligation to move quickly since the constitutional amendment passed, but that she thinks they’re doing it respectably and with lots of public input. The House unveiled a draft voter ID bill last week but the Senate only filed SB 824 Tuesday. It’s similar but also contained more than 24 changes that lawmakers only had 24 hours to digest before Wednesday night’s vote. “This rush over just a few days is not the careful, thoughtful approach we should be taking with our sacred franchise to vote,” said Sen. Mike Woodard (D-Durham). He was the one who told his Republican colleagues during the floor debate that the bill was not what Democrats had feared, and that it addressed security criteria concerns. “However, when it comes to being simple and easy, this bill comes up short,” he added. SB 824 allows more acceptable IDs than the so-called “monster” voter bill that was passed in 2013 and then later struck down as unconstitutional for racial discrimination. Acceptable forms of ID in SB 824 that are valid and unexpired include a state driver’s license or DMV identification card, a U.S. passport, a tribal enrollment card issued by a federally or state recognized tribe and a driver’s license or photo ID issued by another state if the voter’s registration was within 90 days of the election. Photo IDs that have been expired for one year or less also will be acceptable. Student IDs issued by the University of North Carolina, private school systems or the community colleges could be considered acceptable if schools agree to issue those IDs per requirements from the legislature and the State Board of Elections and Ethics Enforcement approves it. Those requirements included security measures schools have to follow with regard to the equipment producing student IDs, making sure the IDs contain photos and giving them to students only after their identity is confirmed (social security number, citizenship status and birth date). The bill also creates a new type of photo identification to be issued to voters for free that contains their photograph and a voter registration number that expires in eight years — although the Senate unanimously adopted a Democratic amendment that extends the expiration date to 10 years. Sen. Erica Smith (D-Bertie) took issue with any expiration date on the photo voter ID card. She added that Social Security cards and birth certificates do not have photos or expiration dates, and, like several of her party members, encouraged lawmakers to take their time to do things right. “It is here now and we need to make it the best bill that we can possibly make it,” she said. Republican Sen. Jerry Tillman, who represents Moore and Randolph counties, said the bill didn’t disenfranchise anybody and that Democrats were trying to make voter ID a single-party issue. “The only thing it disenfranchises is cheating,” he said — though a couple of lawmakers made pointed out on the floor and in committee meetings that there have only ever been two cases of actual voter impersonation fraud in North Carolina. Tillman said the people of North Carolina made their choice and that it was time for lawmakers to implement the bill. “We’ve bent over backward to do everything you wanted,” Tillman added. Other amendments that passed included expanding when county boards can issue photo voting IDs, mandating county boards notify voters 90 days prior to their photo voter IDs expiring and expanding the natural disaster exception to include victims affected 100 days before an election (from 60 days). An amendment put forth by Sen. Ben Clark (D-Cumberland, Hoke) was also adopted that requires voter education materials to inform people that they can vote with or without a photo ID. There was also an amendment approved that specifies what a “reasonable impediment” is if voters do not have a photo ID. Reasons can include having a lost or stolen ID, having a disability or not having enough time to get an ID because of work or family obligations. 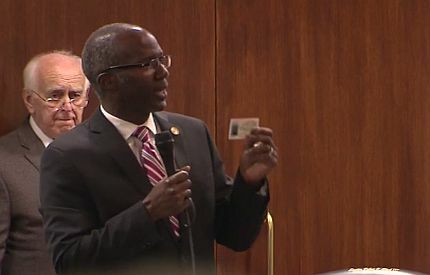 Clark was one of the three Democrats who voted in favor of the voter ID bill’s second reading, along with Sen. Joel Ford (D-Mecklenburg), who is a sponsor, and Sen. Don Davis (D-Greene, Lenoir). Amendments presented by Woodard and Sen. Terry Van Duyn (D-Buncombe) that would have expanded the types of IDs accepted and postponed the five-month rollout time to implement the bill were tabled by Republicans. Some members of the public were able to speak on the matter during two public hearings this week, but there has only been short notice and they were both held in Raleigh. The House isn’t expected to take up voter ID until next week.